Situated in Eastern Anatolia and extending to the Iranian border, is Agri, one of the highest regions in the country with its mountainous formation. Rising up to a height of 5165 m, Mount Agri is the main peak of Turkey and the symbol of the city. This snowcapped volcano is the famous biblical Mount Ararat, the legendary site of the second beginning of the world. It is believed that Noah's ark came to rest in the mountains of eastern Turkey, and the wide plain of Igdir at the foot of the mountain is the first place where Noah set foot after the disaster. A geological hollow near Uzungil village has the shape allegedly of the ark, and it is a place often visited by tourists, being also a beautiful resting spot. Mount Ararat, besides offering magnificent scenery, also provides opportunities for hunting, skiing and mountaineering. Climbing is also possible once you get the necessary permission from the authorities. 95 kms east of Agri, is the town Dogubayazit, comprising spectacular ruins from earlier periods Ishak Pasha Palace, 6 kms outside the town center, is the most important sight, and was constructed by the Ottoman governor, Ishak Pasha, in the 17th century. It has been restored many since, and has become an original building of mixed architectural design. An Urartian king relief and a rock tomb dating to the 9th century BC, are other historical remains near the palace, while ruins from the same period are also to be found near Patnos, another important town of Agri province. An interesting place is the meteoric hole, about 80 years old, located between the Gurbulak border gate and Sancavus village. It is the second largest hole of this type in the world with its 35 m width and 60 m depth. Formerly KARAKÖSE, city, in the highlands of eastern Turkey. It lies 5,380 feet (1,640 m) above sea level in the valley of the Murat River, a tributary of the Euphrates River. The town is a centre for trade in livestock and livestock products and is a transit station on the main highway from Turkey to Iran. Agri is named after Mount Ararat (Turkish: Agri Dagi), situated to the east near the frontier with Iran. Stock raising and agriculture are the main activities of the region. Kurds constitute a large proportion of the population of the countryside. Pop. (1985) city, 54,492. Turkish AGRI DAGI, extinct volcanic massif in extreme eastern Turkey overlooking the point at which the frontiers of Turkey, Iran, and Armenia converge. Its northern and eastern slopes rise from the broad alluvial plain of the Aras River, about 3,300 ft (1,000 m) above sea level; its southwestern slopes rise from a plain about 5,000 ft above sea level; and on the west a low pass separates it from a long range of other volcanic ridges extending westward toward the eastern Taurus ranges. 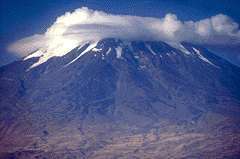 The Ararat Massif is about 25 mi (40 km) in diameter. Ararat consists of two peaks, their summits about 7 mi apart. Great Ararat, or Büyük Agri Dagi, which reaches an elevation of 16,854 ft above sea level, is the highest peak in Turkey. Little Ararat, or Küçük Agri Dagi, rises in a smooth, steep, nearly perfect cone to 12,782 ft. Both Great and Little Ararat are the product of eruptive volcanic activity. Neither retains any evidence of a crater, but well-formed cones and fissures exist on their flanks. Towering 14,000 ft above the adjoining plains, the snowcapped conical peak of the Great Ararat offers a majestic sight. The snowline varies with the season, retreating to 14,000 ft above sea level by the end of the summer. The only true glacier is found on the northern side of the Great Ararat, near its summit. The middle zone of Ararat, from 5,000 to 11,500 ft, is covered with good pasture grass and some juniper; there the local Kurdish population graze their sheep. Most of the Great Ararat is treeless, but Little Ararat has a few birch groves. Despite the abundant cover of snow, the Ararat area suffers from scarcity of water. Ararat traditionally is associated with the mountain on which Noah's Ark came to rest at the end of the Flood. The name Ararat, as it appears in the Bible, is the Hebrew equivalent of Urardhu, or Urartu, the Assyro-Babylonian name of a kingdom that flourished between the Aras and the Upper Tigris rivers from the 9th to the 7th century BC. Ararat is sacred to the Armenians, who believe themselves to be the first race of humans to appear in the world after the Deluge. A Persian legend refers to the Ararat as the cradle of the human race. There was formerly a village on the slopes of the Ararat high above the Aras plain, at the spot where, according to local tradition, Noah built an altar and planted the first vineyard. Above the village Armenians built a monastery to commemorate St. Jacob, who is said to have tried repeatedly but failed to reach the summit of Great Ararat in search of the Ark. The village, the monastery of St. Jacob, and a nearby chapel of St. James were all totally destroyed by an earthquake and avalanche in 1840. Local tradition maintained that the Ark still lay on the summit but that God had declared that no one should see it. In September 1829, Johann Jacob von Parrot, a German, made the first recorded successful ascent. Since then Ararat has been scaled by several explorers, some of whom claim to have sighted the remains of the Ark. 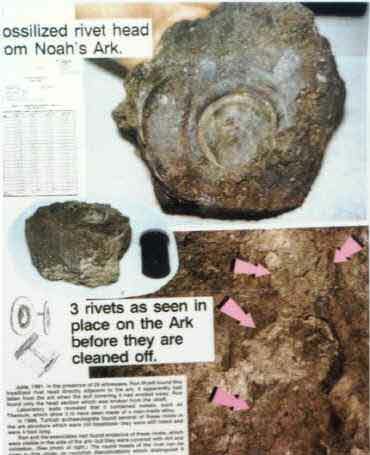 Friends, please prayerfully consider the evidence you will see on Noah's Ark. It may not be important or necessary for you to learn of this discovery, but there are millions of people who need confirmation of biblical artifacts in order to strengthen their faith in God. Satan is strongly attacking this and other discoveries in order to deceive men of God's truth. All the false stories about finding Noah's ark were invented by Satan to "muddy the water," and cause disbelief in the genuine. There is only one verse in the Bible which gives us a hint of where we the ark came to rest, "the ark rested...upon the mountains of Ararat." Genesis 8:4. Where is Ararat? The name Ararat is a large area or ancient country covering eastern Turkey, western Iran and western Russia. "The name Ararat, as it appears in the Bible, is the Hebrew equivalent of ...Uratu, ancient country of southwest Asia...mentioned in Assyrian sources from the early 13th century BC" Encyclopaedia Britanica 15th ed. Some have mistakenly assumed the Bible meant the ark came to rest on Mount Ararat (Agri Dagh), but that is not the case. Mount Ararat is 17,000 feet tall, and is a post-Flood volcanic mountain that gained its extra height after the Flood, therefore there is no reason to assume it is a more likely candidate for the resting place of the ark. The ark came to rest in the mountains of the ancient country of Uratu, not Mt. Ararat. Flavius Josephus, c. 90 AD, the famous Jewish historian stated, "Its remains are shown there by the inhabitants to this day." He quotes Berosus the Chaldean, c. 290 BC, who indicated tourists would take home pieces of the ark for making good-luck charms, "It is said there is still some part of this ship in Armenia, at the mountain of the Cordyaeans; and that some people carry off pieces of the bitumen, which they take away, and use chiefly as amulets for the averting of mischiefs." These comments tend to indicate its location would not be in an inaccessible area. At some point, the ark was covered by a mud and lava flow which caused future generations to lose its location. The Turkish government has double-verified Mr. Wyatt's tests, and they have given him credit for the discovery. 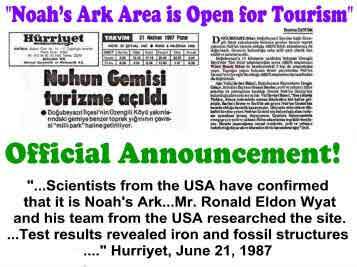 The announcement appeared in Turkey's largest newspaper on June 21, 1987. The area was first designated a National Park, and then it was upgraded to the status of a National Treasure. The government has built a visitors' center overlooking the site and issued official tourist brochures so people of all races can come and see the ark! Visitors' center constructed by Turkish Government conveniently overlooks the ark. 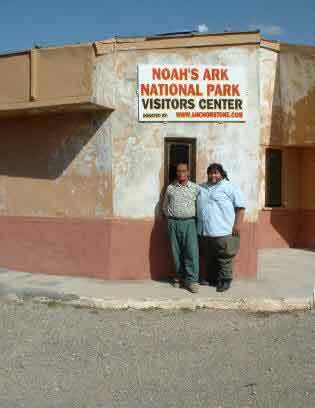 "Noah's Big Boat" sign points your way to the ark from the main highway. We are looking toward Iran about three miles behind me. To my left and on the mountain 5 Km away, lies Noah's pride and joy. The Length Matches the Biblical Record! The length of the ruins of the ark is 515 ft., which is exactly 300 Royal Egyptian cubits (20.6 inches)! Moses was schooled in Egypt and was not familiar with the Hebrew cubit which was not even in existence when Moses wrote Genesis. Mr. Wyatt's tests show there is a grid-work of metal brackets and metal rivets throughout the structure. Inside the ark he found coprolites (fossilized animal droppings), a petrified antler horn (see photo below), metal waste or slag that was used as ballast in the boat, and Mr. Wyatt's very best piece of evidence is an 18 inch petrified deck timber, unearthed before Turkish officials, that is comprised of three separate layers of laminated wood! Radar scans show where the ark's singular eight ft. door is located in the right front, and the evenly-spaced rib timbers are visible along the earthen side of the formation, even though they have suffered greatly from water damage and ice-fracturing over the past 4,300 years. The mountain on which the ark rests is interpreted as Doomsday Mountain. 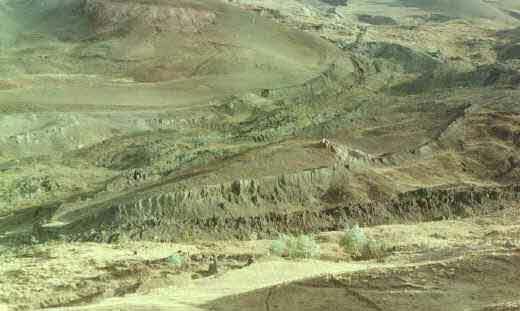 The photo above shows the ark deeply embedded in the surrounding terrain. In 1978, when Mr. Wyatt was returning to Nashville, he prayed that God would send an earthquake to "excavate" the site. When arriving in Nashville the headlines read, "Earthquake in Eastern Turkey." The earth dropped from around the sides of the ark, defining the formation more clearly and making it more accessible for research. Metal Used in the Ark! The ark contains a large amount of metal fittings used to secure the large timbers together. These two photos below are from our October 2000 trip to the site. Notice how there was once two large rivet fasteners, but now only one is left. A large metal plate was positioned behind the rivets. We received a positive metal reading when passing the metal detector over the rivets. We should not be surprised to find metal alloys used in the ark, because Genesis 4:22 states, "Tubal-Cain, an instructor of every craftsman in bronze and iron." 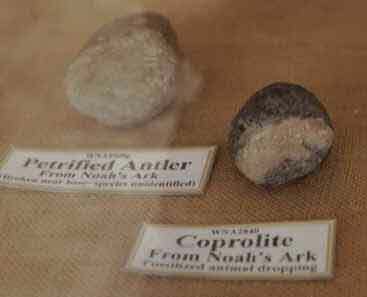 (Left) Ron Wyatt found a beautiful specimen of one of the metal rivets used on the ark. It was tested and found to contain high-tech metal alloys, such as titanium, magnesium, and aluminum, etc. Critics have said Ron did not find this fine specimen on the ark but just manufactured it. Well, as you will see below, we found the same objects and had them tested. They too proved to have the same metals, in the same percentages! (Below) Two rough rivets in lower portion of photo. 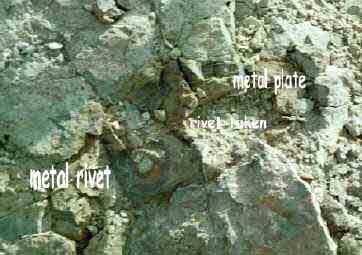 Lab Report Shows Fossilized Rivet Contains Man-Made Metals! 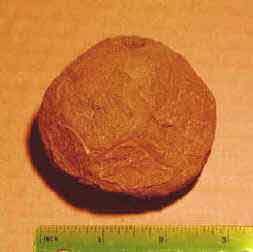 Galbraith Laboratories of Knoxville Tennessee has tested the specimen for three metals we requested. We asked them to test for aluminum, iron, and titanium. It costs $60 to test for each metal requested. The results show 8.35 % iron, 8.35% aluminum, and 1.59% titanium. These results are similar to those produced in the analysis of the rivet found by Mr. Wyatt. 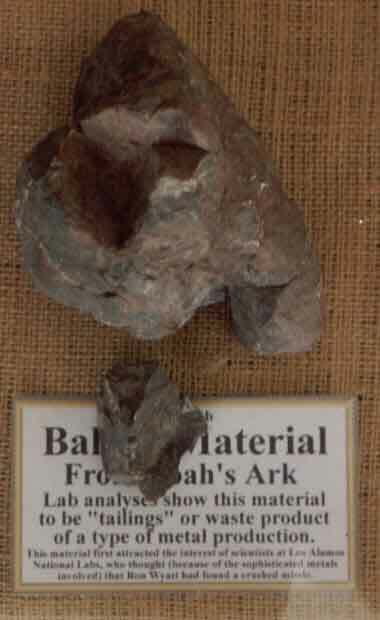 Since the specimen is fossilized, it is assumed a large portion of it is now silica replacement, reducing the percentage of metal that was originally in it when it was made. These rivets are found in several locations on the outside of the Ark, and are probably buried inside the Ark by the hundreds or thousands. In comparison to others, this specimen is in poor condition. Second specimen is also man-made! Our second item tested by the lab reveals it to be man-made. It was found on the side of the ark. 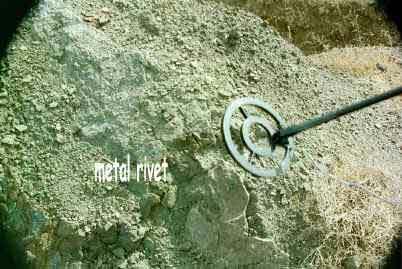 It gave us a positive metal reading with our metal detector when we were at the site. Later in Istanbul, we tested it with a magnet which produced an attraction to it. It appears to have been flared out (left photo) by pounding the center. The left photo is facing us the way it appeared on the starboard side of the Ark. Notice the side view (right view) which shows the tapering effect. 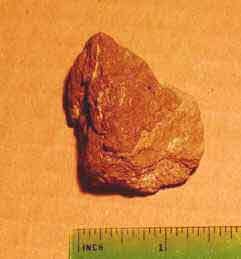 Test results from Galbraith Labs, completed in June 2001, reveal it has man-made aluminum metal in it! It contains 8.08 percent aluminum, 8.24 percent iron, 1.34 percent titanium, and 3.82 percent magnesium. Click on thumbnail to read lab report. then hardened and took the curvature of the hull (right photo). 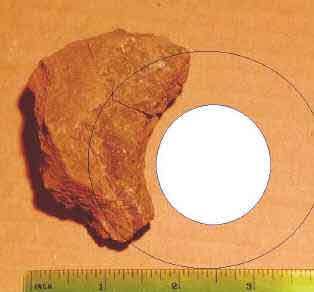 It has a coating on the convex side, while the flat side appears to be metal. 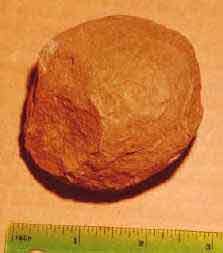 This is an example of the metal ballast that has been found in the hull of the ark. 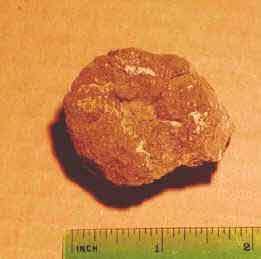 It is made up of manganese primarily, which is a by-product of forming magnesium that was used in the metal rivets. Found by Ron Wyatt. The western side of the ark had this square object that had the appearance of metal on its top and three sides.. It also contained an impression in it, much like it had been struck while it was hot. It was at a higher level where I could not measure it. It may have been 8 inches in diameter.